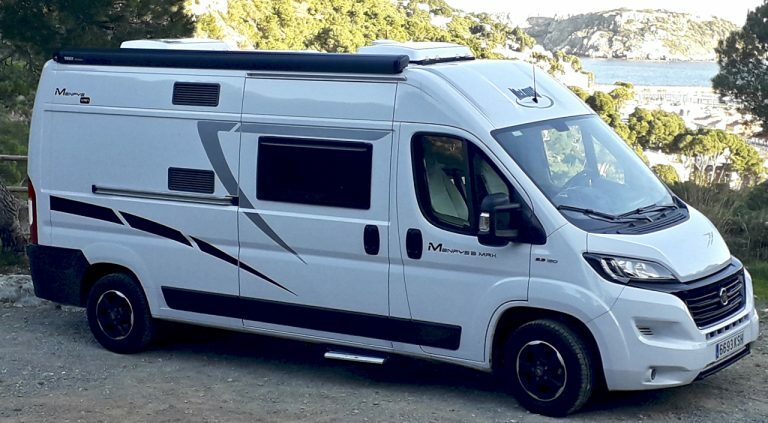 Camper Van Rental FIAT DUCATO MC LOUIS MENFYS PRESTIGE 3 MAXI (December2018) with Medaventura. Have 4Places to travel and sleep. Bike Rack, GPS, Rear Parking Assistance Camara, Speed Regulator, Assisted Direction, Centralized Closure, Electric Windows, USB/Audio Input, Heating, Air Conditioning, Leather Seats. Front Gyratory Seats, Retracteble and extensible table, Fridge 90l. With freezer (gas/electric/battery), Gas Stove, Lateral Awning, Solar Panel, Outdoor Light, Table and chairs for Camping, TV, Wc, Shower, Hot Water, Kitchen-Tools, Cutlery and dishes, Italian Coffe Maker, Barbecue, Mosquito Nets, Darkeners, Bed Sets. ALL RISK INSURANCE. UNLIMITED KILOMETRES!! Rent now our camper van and enjoy the surroundings of the Natural Park of Montgrí, Illes Medes i Baix Ter at your own pace. And if you come to stay at Estartit, you will have Paddle Boards and kayaks fro free during your renting!! ALL INCLUDED IN THE PRICE!! In summer, May and September, minimum rental 1 week. Select by clicking on all the days you want to rent the van and fill out the form. We will answer you as soon as possible to confirm your reservation!